The Oklahoma City plant has participated in Toys for Tots for the past four years. 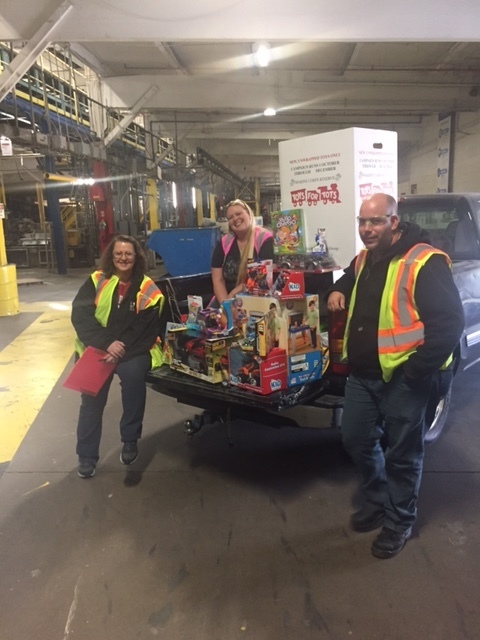 The plant consisting of about 30 employees, filled three bins this year with toys for the drive. One employee, Art Munson, who holds this cause close to his heart, made a significant donation again this year as he has in the past. Munson is a maintenance mechanic at the plant and has been working for JM for just over six years. Plant Manager, Keith Gordon, mentioned that “even though Art had only been back for a few months at the time of the drive (he was recently out for around two months on medical leave), he still did what he usually does and made a significant contribution to the drive.” Munson has always contributed and it has always been more than just a few toys. He also always encourages the other employees to participate, to him it is more than just another donation, it is something that needs to be done and something that has a significant impact on his community.